Practicing clearing malfunctions in a semiautomatic is a skill that could mean the difference between life and death. When your pistol malfunctions during a range session, do you stop and look at it, dumbfounded? Do you set your pistol down and raise your hand for assistance because you aren't sure how to remedy the problem? These are common reactions for a new shooter, but if you're going to carry a pistol or keep one in the home for defensive purposes, you need to be your gun's emergency roadside mechanic. After all, lives may depend on your ability to fix your gun and get back in the fight. When pressing the trigger of your pistol produces a "click" instead of a "bang," it's time to employ the immediate-action technique, also known as "tap, rack, assess." There are a few ways to accomplish this, but they all share some common traits. The first step to clearing most malfunctions is to release your grip with your non-dominant hand and use your palm to slam the bottom of the magazine. The rationale is that the malfunction may have been caused by the magazine not being fully seated in the magazine well. "Tapping" the magazine will help ensure it's locked in place. Merely tapping the magazine won’t enable you to fire the pistol. Although this is an important first step, merely tapping the magazine won't enable you to fire the pistol. You need to cycle the action to ensure any obstruction in the chamber is cleared and a new round is fed. To facilitate this, reach over the pistol and pinch the slide between your fingertips and the heel of your palm. Be sure to grip behind the eject port so your hand doesn't block the ejection port and induce a double-feed stoppage. Grip established, rack the slide forcefully to the rear. Racking the slide is easier with the momentum generated by a quick, aggressive cycling action. To ensure the slide travels completely rearward and therefore has the most spring tension to drive it back into battery, at the same time push forward on the grip with your dominant hand. When you release the slide, allow your non-dominant hand to strike your chest to confirm you don't ride the slide as it travels forward. Riding the slide decelerates the slide's forward movement and could prevent the pistol from going back into battery. A popular tweak to this technique is to rotate the pistol to the right- toward the ejection port- so gravity will help clear the spent casings or bad rounds from the pistol. 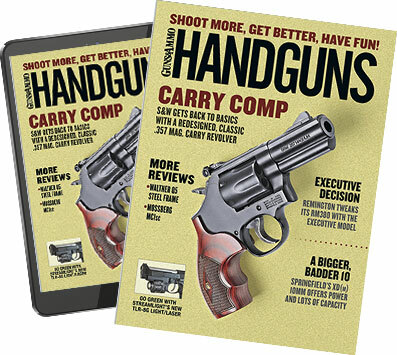 After tapping the magazine and racking the slide, quickly assess the condition of your pistol and the threat. If you cant the pistol slightly to the left, you'll be able to see if the slide is completely forward. If it is, your gun should be ready to fire. At this point, it's time to determine if firing your pistol is an appropriate response. Does the assailant still present an imminent deadly threat, or has he fled, taken a hostage or given up? Remember your response must be based on the current actions of the assailant. Just because he presented a deadly threat 10 seconds ago doesn't mean it would be legally justified to shoot him now. When I was a new police officer 20 years ago, we were taught to clear a malfunction while keeping the arm extended, with the pistol oriented to the threat. This was intended to prevent your adversary from recognizing your pistol was not operational. Also, since your muzzle was still pointed at the threat, it was considered faster to aim your pistol when the stoppage was remedied. Today, most pistol instructors advocate keeping the gun close to the body while clearing a malfunction. After all, a seamstress doesn't thread a needle with fully extended arms. Doing so would be quite frustrating and time-consuming. While sewing may not be an urgent endeavor, clearing a malfunctioned pistol certainly is. In the modern version of the immediate-action technique, bring the gun toward your body and orient the magazine toward your non-dominant side. This positions it perfectly for a firm palm strike to the bottom of the magazine to ensure it's fully seated. Rather than racking the slide as described earlier, instructors like Dave Spaulding advocate a different technique. Rather than grip the slide with your fingertips and hand- thumb facing toward you- turn your hand over, thumb facing away. Gripping the slide with your thumb and as many fingertips as you can is a more natural motion than gripping with your thumb facing toward you. Grip the slide with your thumb and as many fingertips as you can fit onto the slide. This is a more natural motion than gripping with your thumb facing toward you. With this method, instead of rotating the pistol to the right- toward the ejection port- rotate the pistol to the left. This may seem counterproductive, but when you consider you are rotating the gun until the top of the slide is in about the seven o'clock position, it's easy to see that gravity will still help clear the ejection port of spent casings or unfired rounds gumming up the works. Again, rotating the pistol inward is more natural than rotating it outward. Many equate this to pouring out a beverage. You would almost certainly invert your cup by rotating it inward. It's easier to turn the cup upside down this way. Your pistol is really no different. The immediate-action sequence won't clear a double-feed. If you've already performed the sequence and the pistol still won't fire, or if you recognize that your pistol has a double-feed before executing immediate action, here's what you need to do. First, you must remove the magazine from the pistol. Depending on the pistol and magazine you're using, you may simply be able to grasp the bottom of the magazine firmly and strip it from the pistol. However, on certain pistols and with certain magazines, this won't work. In these cases, you will have to first lock the slide to the rear by pressing up on the slide stop while fully retracting the slide. How will you know whether you can get away with not locking the slide to the rear? Practice with your carry gun and magazine. This is something you need to know before you're fighting for your life. My police training taught me to drop the magazine after stripping it from the gun. After all, the magazine could be the culprit. But police officers typically carry at least two spare magazines. What if the magazine you strip from the pistol is your your only one? When the magazine in your pistol is all you've got, secure it under your shooting-side armpit until you've cleared the malfunction. After removing the magazine, invert the pistol and cycle the slide until the chamber is clear. Most instructors recommend racking the slide three times. Once or twice may not be enough, and if the third time isn't a charm, chances are neither will subsequent attempts. If you see the spent casing eject after the first time you rack the slide, you can move on. At this point, you have an empty pistol. If you have a spare magazine, load it into the pistol, but don't forget you still need to rack the slide to chamber a round. If you had only one magazine, retrieve it from under your arm, load and rack the slide. This is not a particularly complicated process, but it must be practiced extensively because it needs to happen ASAP. If you understand what needs to occur mechanically to fix your gun, the technique for one-handed malfunction clearing is really no mystery. Speaking of practice, have you considered that an injury to your hand or arm may require you to clear a malfunction one-handed? If you understand what needs to occur mechanically to fix your gun, the technique for one-handed malfunction clearing is really no mystery. The immediate-action sequence can be performed by tapping the bottom of the magazine on your knee, hooking the rear sight or ejection port on your belt, holster, boot or other solid object and racking the slide. No big deal, although it's something you really need to practice. For safety, this technique and the following one should be practiced initially with dummy rounds. You must be mindful that your muzzle isn't pointed at you or anyone else. Only when you are proficient with these techniques using inert training rounds should you even consider practicing them with live rounds. When you do, start slowly, with safety always being the most important consideration. The next technique deals with clearing a double-feed with only one hand. For a right-handed shooter executing a right-handed-only double-feed clearance, hook the rear sight or ejection port on your belt, holster or other hard object while pushing up on the slide stop with your thumb and racking the slide completely rearward. With the slide locked open, hook the magazine on a pocket and press the magazine release then rip the magazine from the pistol. If that's your only magazine, you will need to pick it up because it's kind of important. With the magazine ejected, hook the rear sight or ejection port on something and cycle the slide as previously described to clear the chamber. Holster the pistol. Insert the magazine. Draw the pistol and hook the rear sight or ejection port on an object to cycle the slide and chamber a round. As you probably guessed, clearing a double-feed left-handed can be more difficult- especially for right-handed shooters but even for lefties, since few guns offer ambidextrous slide locks and you have to deal with controls on the other side of the gun. The pistol doesn't care which hand you use to clear it. As far as the pistol is concerned, the same thing is happening. To lock the slide back with the left hand, you'll need to apply upward pressure on the slide stop with your left index finger rather than your right thumb. Similarly, you'll need to press the magazine release with your left index finger while stripping out the magazine with the help of your pocket. From there, cycle the slide until the spent casing is ejected. If your holster is on your right side because you're a right-hander, you'll need to place the gun between your knees or kneel and secure it behind your bended knee (with the muzzle facing away from you). Insert the magazine. Hook the slide or ejection port and rack the slide to chamber a round. And remember that if you're dealing with a malfunction in real life while facing a deadly threat, if "tap, rack, assess" doesn't address the problem, running to cover is an excellent second step when such a move is possible. Guns malfunction. Murphy's Law dictates this will occur at the most inopportune time. That's why it's important to have an immediate and reliable solution to clear any type of pistol stoppage. When your handgun malfunctions in the middle of a fight, don't contemplate it- fix it.